Invite a higher standard to the road with the interior design of the 2016 Ford Mustang Shelby. Through an acute attention to detail and an array of exclusive and premium features, you are able to enhance your on road experience. Features such as Intelligent Access with Push-Button Start allow you to unlock your vehicle and start the engine without removing your MyKey® from your pocket or purse. Sit back on the delightful RECARO® cloth seats with Miko® Suede inserts as you hold onto the Alcantara® leather-wrapped steering wheel, featuring steering wheel-mounted five-way buttons. Keeping everyone satisfied is a simple task as you enjoy the Dual-Zone Electronic Automatic Temperature Control System, which is able to maintain two differing front temperatures simultaneously. Flexibility is brought to you through the 50/50 split folding rear seats, because you should never have to sacrifice spaciousness for performance. A bold and performance reflecting exterior is presented on the 2016 Ford Mustang Shelby through the sharp body contours, aluminium hood with a unique vent and wide aluminium front fenders. HID headlights with signature lighting, Daytime running lamps and LED taillamps with sequential turn signals enhance visibility in a variety of weather conditions. Expand your awareness of your surroundings through the sideview mirrors with integrated blind spot mirrors and variable intermittent windshield wipers. Connect to the outside world on the go in the 2016 Ford Mustang Shelby thanks to a series of advanced technological features and controls. Utilize the next generation of voice-activated technology of the advanced SYNC 3 system to help you access your personal devices and engaging in hands-free communication. You are also provided with seamless directions to a series of destinations through the Voice-Activated Navigation System. Keep tabs on all of your performance details through the optional Track Apps system and its 4.2” message centre that provides updated information on acceleration times, last results, saved results and brake performance. Entertainment is found with the optional SiriusXM Satellite Radio, offering over 120 commercial-free channels of music sports, news and more. Elevate your performance and protection in the 2016 Ford Mustang Shelby through a series of available genuine parts and accessories. Enhanced traction and control through the addition of the stunning 19” Ebony Black-painted aluminium alloy wheels with wheel centre caps, and a wheel lock kit. You are able to experience mesmerizing aerodynamics with the help of the raised rear spoiler as vehicle protection is promoted with the all-weather floor mats and full vehicle cover. Surround yourself with adrenalin-inducing performance in the 2016 Ford Mustang Shelby. Through a combination of aggressive capability and refined drivability, this vehicle is able to offer you a world of power and control. Smooth handling comes forward with the Selectable-effort Electric Power-Assist Steering (EPAS), featuring Normal, Sport and Comfort mode. For an aggressive first gear and a powerful launch off the line turn to the 6-speed Manual Transmission, which works to promote responsiveness. Durability is gained through the independent rear suspension system, featuring aluminium alloy rear knuckles and H-arms to help reduce unsprung mass and prevent body roll through its ability to isolate road imperfections and bring stable road handling. Redefine the meaning of power in the remarkable 2016 Ford Mustang Shelby. Combining iconic heritage and modern technology, you are brought into next realm of the driving world. Customize your Shelby through Genuine parts and accessories to ensure that everything is how you prefer of this dream car. Come check out the new 2016 Ford Mustang Shelby at your local Vernon Ford Dealer – Watkin Motors. 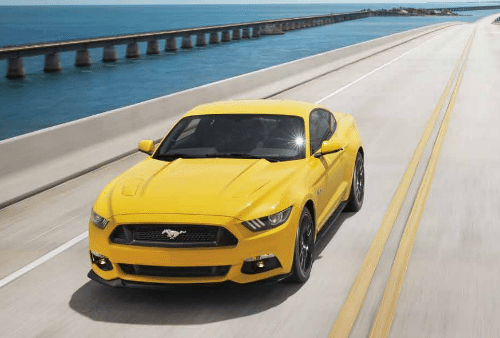 Through our knowledgeable staff and dedicated team of professionals, we here at ﻿﻿﻿Watkin Motors Ford ﻿﻿﻿are prepared to go above and beyond in helping you drive away in your own Mustang today!